Compare pricing for airport limos, shuttle buses, sedans and more from all across the USA! Price4Limo provides on time guaranteed car and limo service to and from EWR Newark Liberty International Airport. Getting a free quote for airport transportation takes less than 30 seconds and no email is required! Price4Limo provides punctual airport transfer service to and from Newark Liberty International Airport (EWR). We offer the best EWR car service with all inclusive rates and excellent reliability. Why hire a taxi or use a ride sharing app when you can have a luxury car or limo service take you to and from EWR in style! Our professional chauffers fully licensed, undergo rigorous background checks and follow the quickest routes making for an enjoyable trip to EWR. Schedule your airport transportation today and see why Price4Limo is a trusted source for Newark airport limo service and EWR transfer service. No need to worry about your Newark Airport transfer when you have Price4Limo taking you there. We'll be with you every step of the way. Don't stress over leaving your car at the airport for long term parking when you arrange your airport drop off service with us. We'll arrive early to make sure you have plenty of time to make it to your flight. Whether you hire a luxury sedan or a limousine to drop you off at EWR you are guaranteed an enjoyable ride there. Our customer support team is available 24/7 if you have any questions about your airport transfer service to Newark Airport. Skip the wait for a taxi or ride share to take you home from EWR. Instead of waiting for the next available ride or public transportation pickup you should make sure you have a luxury Newark Airport limo service ride to pick you up along with your fellow travellers. We can have our drivers meet you curbside or greet you in baggage claim, whichever you prefer. If you need some time to gather your luggage or grab a bite to eat then we can arrange an ideal time to pick you up. Our drivers can track your flight so they will know to arrive either exactly on time, early or with a requested delay. 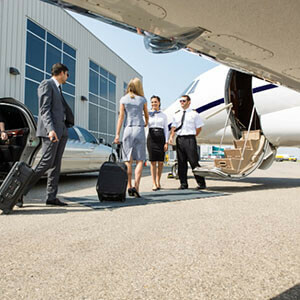 Price4Limo's Newark Liberty International Airport limo and car service can take care of all your transportation needs. Newark Liberty International Airport (EWR) resides in south Newark and serves Essex County and the rest of the tri-state area. Price4Limo can arrange airport transportation to and from anywhere within the area.